Iain Hamilton was born in Glasgow, Scotland, on June 6th, 1922, and died July 21st, 2000, in London. An important figure in music on both sides of the Atlantic, he was a composer of both stage and concert works, whose music has been praised for the ‘brilliance of its orchestral textures, uninhibited lyricism” (Anna Karenina: Opera) and “a vast terrain of color, movement, expression and invention” (Voyage: Horn and Chamber Orchestra). These quotes are typical of the critical commentaries on Mr. Hamilton’s music, which constantly refer to the color, texture, variety, lyricism and craftsmanship. Following his schooling in London, he became an apprentice engineer, and remained in that profession for the next seven years. In his free time, he undertook the study of music. After winning a scholarship to study at the Royal Academy of Music, he decided to devote himself wholly to a musical career. He went on to win a Koussevitsky Foundation Award, the Royal Philharmonic Society’s Prize, and the Dove Prize, the highest award from the Royal Academy. He earned a Bachelor of Music degree from London University and was awarded an honorary Doctorate of Music from Glasgow University. Long important in British musical circles, Mr. Hamilton’s influence also extended to the United States, where he lived for 20 years (1961 to 1981). From his home in New York City, he commuted to Duke University, where he was Mary Duke Biddle Professor of Music. He then returned to London, and lived there until his death. In April, 2002, the Mary Duke Biddle Foundation unveiled a bas-relief commemorating the composer in the Music Department at Duke University. Mr. Hamilton’s extensive catalogue comprises works in all genres, including orchestral, chamber, vocal, solo, and also opera, the category for which he was arguably best known. He wrote several operas, including The Catiline Conspiracy, Anna Karenina, and The Royal Hunt of the Sun. They received performances (and also revivals, in several cases) by such companies as Scottish Opera, English National Opera, and the BBC. The Catiline Conspiracy was hailed as “a masterpiece” in The Scotsman headline after its 1974 premiere in Stirling, the Glasgow Herald noting in addition that “there could hardly have been a member of [the] audience who was not reminded of Watergate.” Anna Karenina, premiered by English National Opera in 1978, was first performed in North America in 1982 by the Los Angeles Opera Theater. Raleigh’s Dream was commissioned for the North Carolina British-American Festival at Duke University in 1983, where it was premiered at the celebrations for the tercentenary of the founding of Raleigh’s colony in 1584. In the concert hall, Mr. Hamilton’s works have been performed by many of the leading British orchestras and ensembles; among his compositions from his final years are The Transit of Jupiter (first performed by the BBC Scottish Symphony under Jerzy Maksumiuk in 1995), and Bulgaria Invocation: Evocation for Orchestra, as yet unperformed. In the United States, commissions included those of the Eastman School of Music for Piano Sonata No. 3 and the Library of Congress for Hyperion for chamber ensemble. In 1996, the New York Philomusica premiered the 1993 Piano Quintet with performances in Pearl River and New York City. His last works include The Wild Garden (5 pieces for Clarinet and Piano) and London: A Kaleidoscope for Piano and Orchestra, written in 2000. 22:00 Fl. Ob. Cl. Bsn. Hn. Tpt. Tbn. Bar. Dramatic Commentary for Voices, Narrator and Orchestra 25:00 1 0 1 0 – 1 1 1 0; Perc. Pno. Hp. Str. for Soprano, Mezzo, Tenor and Baritone Soloists, SATB Chorus and Orchestra 1:05:00 3 3 3 3 – 4 3 3 1; Timp. Perc. Hp. Str. for Mixed Chorus and 10 Winds 22:00 SATB Chorus; 2Ob. E.H. 2Bsn. 2Tpt. 3Tbn. 2:00:00 SATB Soloists; SATB Chorus; 1 2 0 1 – 2 1 0 0; Str. for Orchestra 20:00 3 3 3 3 – 4 3 3 1; Timp. Perc. Pno. 2Hp. Str. for Orchestra 12:00 3 3 3 3 – 4 3 3 1; Timp. Perc. Hp. Str. Invocation: Evocation for Orchestra 23:00 2(Picc.) 2 2 2 – 4 3 3(B.Tbn.) 1; Timp. Perc. Hp. Str. Concerto for Orchestra 25:00 3(Picc./Fl. in G) 3(E.H.) 3(EbCl./B.Cl.) 3(Cbsn.) – 4 3 3 1; Timp. Perc. Pno./Cel. Hp. Str. 25:00 Solo Hp. ; 1(Picc.) 1(E.H.) 1(B.Cl.) 1 – 1 1 0 0; Perc. Str. Four Impressions for Orchestra 22:00 2 2 2 2 – 4 3 3 1; Timp. 3Perc. Hp. Str. (1967 Version) 20:00 Solo Pno. ; 2 2 2 2 – 4 2 3 1; Timp. Perc. Hp. Str. 30:00 Solo Pno. ; 2 2(E.H.) 2 2 – 4 3 3(B.Tbn.) 1; Timp. Perc. Cel. Hp. Str. for Violin, Viola and Chamber Orchestra 20:00 Vln. Vla. soli; 1 1 1 1 – 2 1 1 0; Hp. Str. 26:00 2 2 2 2 – 2 0 0 0; Str. 50:00 3 3 3 3 – 4 3 3 1; Timp. Perc. Hp. Str. 24:00 1 1 1 1 – 1 1 1 0; 2Vln. Vla. Vcl. Cb. 17:00 2(Picc.) 2(E.H.) 2(B.Cl.) 2 – 4 3 3(B.Tbn.) 1; 2Perc. Hp. Str. 26:00 2 2 2 2 – 4 2(2Cornets) 3 1; Timp. Perc. Hp. Str. Concerto No. 2 for Violin and Orchestra 25:00 Solo Vln. ; 2 2 2 2 – 4 2 2 0; Perc. Pno. Str. for 2 Trumpets and Orchestra 20:00 2Tpt. soli; 2 2 2 2 – 4 0 3 1; Timp. Perc. Pno. Hp. Gtr. Str. for Soprano and Orchestra 21:00 Solo Sop. ; 2 2 2 2 – 4 2 3 0; Timp. Perc. Hp. Str. Seven Settings of George Herbert, for High Voice and Orchestra 25:00 2 2 2 2 – 4 2 3 0; Timp. Perc. Hp. Str. Dramatic narrative in 1 act 1:00:00 4 Perc. Xylo. Marimba Glock. Timp. Hp. Pno. Cel. Opera in 2 acts, after Tolstoy. 2:15:00 3(Picc.) 3(E.H.) 3(B.Cl.) 3 – 4 3 3 1; Timp. 3Perc. Hp. Str. An opera in two acts. 2:00:00 2(Picc.) 1(E.H.) 1(B.Cl.) 1 – 2 2 0 0; Perc. Hp. Pno. Str. A lyric comedy in two acts. 2:00:00 2 2 2 2 – 4 3 3 1; Timp. 2Perc. Hp. Str. A dramatic commentary in one act, after Lucan. 25:00 1 0 1 0 – 1 1 1 0; Perc. Pno. Hp. 1Vln. 1Vla. 1Vcl. Opera in prologue and 8 scenes. 1:25:00 1 1 1 1 – 1 1 1 0; Perc. Hp. Str. Lyric drama in one act for radio or two acts 1:30:00 (1 act) or 02:00:00 (2 acts) 2 2 2 2 – 4 3 3 1; Timp. 4 Perc. Pno. Cel. Hp. Str. Opera in 2 acts, after Ben Jonson. 2:00:00 2 2 2 2 – 3 2 7 0; 2Perc. Hp. Str. Opera in 2 acts, based on the play by Peter Shaffer. 2:15:00 2 2 2 2 – 4 3 3 1; Timp. 4Perc. Marimba Xylo. Org./Cel. Hp. Str. Opera in 1 act. 1:40:00 2 2 2 2 – 2 2 2 1; Timp. Perc. Hp. Str. for Mixed Chorus, Wind Ensemble and Percussion 20:00 SATB Chorus; 3 3 3 2 – 5 4 5 1; Perc. This volume is a real ‘must play’ for exponents of modern piano music. It is demanding rhythmically and technically and consequently is destined for the advanced pianist. Six very colorful, less difficult concert pieces… good, short, up-to-date works. The real thing… an immensely confident score, in its intricately worked structure of motifs, in the richness, density, and brilliance of its orchestral textures, and in its uninhibited lyricism. Aurora… was designed to show off its virtuosity, which it certainly does. …In its color, brevity and clear form, it is easy to like. A brilliantly forthright, individual and framatic piece of music…a shapely communicative work. An impressive world premiere. Mr. Hamilton uses… avant-garde devices with imagination and restraint. There are exceptionally fine passages, where voices echo and re-echo, and towards the end, sustain a pianissimo chord endlessly. Lyrically concentrated and elegantly crafted, these vignettes call for the most subtle kind of expressive nuances. An intimate study in idealism, disillusionment, and stoical acceptance…the score is a very fluent and skilful essay in the neo-romantic vein, craftily structured from a mosaic of motifs and written with the same flair for atmospheric instrumentation. The music… is fierce and desperate, full of agonized gestures, it has brief gentler moments, too… we were left feeling appalled at the horror and futility and beastliness of war. …intensively dramatic in its range of expressive colour, inventive ideas, and vivid impact. It is an attractive concert piece, cast in clear, light, mostly primary colours, and expertly put together. Relentlessly brilliant… a tour de force. Iain Hamilton’s [Sonata No. 2] is an awesome work, a dissonant exploitation of the keyboard in terms that recall the linear jaggedness of Schoenberg and the motoric repetition and vitality of Bartok. Impressive lyrical passages and… effectively stark and colourful orchestration. Hamilton has produced a well-conceived and interestingly executed twentieth-century sonata. A three-movement piece containing an impressive variety of ideas and textures and radiating a fluency, and at times ebullience… Hamilton has created something worthwhile and beautiful simply for itself. The four movements of the new work carry, on the whole, not only an impressive charge of emotion but are sustained with a keen ear for timbre and a brave ear for tonality. A blazing affirmation of the human spirit… extremely accessible at an initial hearing. Its impact will surely grow with repeated hearings… and should enter into the international repertory rapidly. The great quality of the score is the musical gesture, the orchestra sound or phrase or rhythmic motif which makes an instant dramatic point. The most haunting musical impression of this Easter’s music-making remains that of Iain Hamilton’s extraordinarily beautiful The Passion of Our Lord According to Saint Mark. [Hamilton] uses the orchestra brilliantly… the orchestra’s role is generally to underpin Hamilton’s brand of free-flowing cantilena, admirably flexible so that more than usual in opera the pace of dialogue varies as it does in the play. … immensely impressive… it was the best new work added to the English National Opera’s repertory for some seasons past. …If I were directing the ENO, I would be commissioning Hamilton to write another opera right now. 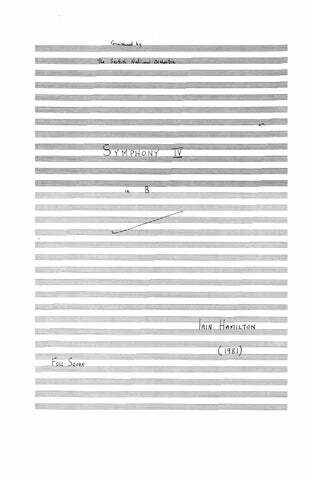 …thoroughly British, thoroughly magnificent… The varied, impressive score substantiates clearly Hamilton’s rank as the foremost of contemporary composers in England and possibly in the world. Vespers, 1980 is a major new work that will endure. …a virtuoso piece of utterly contemporary demeanor. It is extraordinarily refined. The textures are glowingly transparent and loaded with vigor and color. The degree of musical intelligence and technical facility are impressive in the extreme. It is undoubtedly one of Iain Hamilton’s finest achievements, and it makes a strong emotional impact.